We're officially "wheeled!" Our van is finally here, licensed, registered, insured and road-ready. 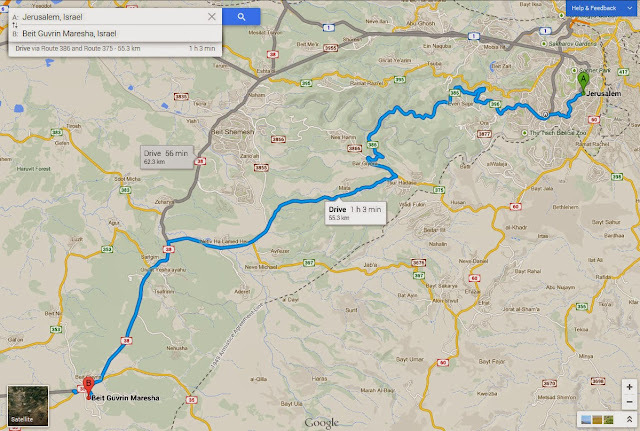 We hit the trails this week with our first trip out of Jerusalem - to the Bet Guvrin Maresha National Park. Just 45 minutes away from our perch in Holyland park, we headed down out of the hills of Jerusalem, descending through Ein Kareem and winding through the valleys to the flat plains of Maresha below. The same plains where King Asa of Judah met and defeated an invading army from Ethiopia (2 Chronicles 14). No Ethiopians anywhere in sight today, but we did find plenty of interesting caves to explore. This area has been known for centuries for its mines and quarries - the top meter or so of hard surface rock gives way to softer chalky rock beneath. The bell-shaped caves resulted from the top-down mining techniques common to this area. The miners "cracked" the top shell, and then dug down into the softer chalk, widening the caves as they went deeper, and pulling the quarried rock (and hopefully the miners too, at the end of the day) up through the hole at the top. The entrance to the Bell Caves complex today is via an arched doorway, leading to the cool shadows of the caverns beyond. Ancient chisel marks were still very much in evidence as we explored the cave complex - a linked collection of several former bell-shaped caves, now accessible via well-maintained trails throughout the park. With the chimney-like entrance holes some 50-60 feet above our heads, the chiseled walls curved above our heads to form natural archways. Pockets of harder rock left behind by the miners formed fascinating formations along the walls, and far above our heads, a colony of bats squeaked and rustled in dark corners. After exploring the Bell Caves, we headed back up to the surface before driving a short way to the remains of the Biblical city of Maresha on a Tel (hill) to the north of the caves. Several more caves to explore here: the burial caves prompted the kids to go searching for mummies, and strike their best "Zombie" poses. Our last stop on this trip was a scrabble up the side of the Tel, and then deep underground into a deep cistern complex. That's all for this update... lots more photos of this trip available here. With 65 more National Parks to visit, and a brand new National Parks pass in hand, there's plenty more yet to see! this is something I need to visit. thanks for interesting article .